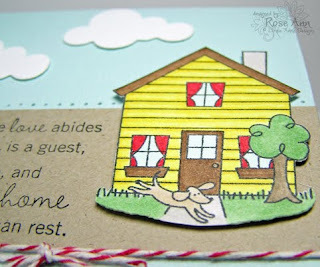 My card uses two Simply Singles stamps, and they are House and Home Sweet Home. Thanks for stopping by, and I hope you'll join me in checking out all of the other Team Members' creations! I'm sure they'll be fabulous!! Rose Ann, this is adorable! That image is so sweet! The clouds look awesome there!!! Totally adorable Rose Ann. A very sweet card! I second the others - sweet and very adorable. This is fabulous Rose Ann! Great job relating it to the challenge. This is too precious, Rose Ann! I love your little scene! I think we were on the same wave length today!! Great goal! Love the colors and how you popped up the clouds and the house. This is terrific! Love the layout and your coloring is wonderful! This is super cute Rose Ann! I love the bright colors. i love this rose ann!! so cute..and i'm on an organizing kick too..good luck!! This card just makes me smile Rose Ann!! I love your cheery little yellow house and puffy little clouds. Love that sentiment too. I love how you cut out the house and the clouds. This card is so neat and tidy. Nice tie in with your goal! So sweet, Rose Ann! That's a wonderful sentiment! What a darling little scene you created here, Rose Ann....I just love that sweet little yellow house, clouds, and the beautiful sentiment!!!! Love the clouds paired up with the house...tooo cute! Love it! Those clouds and that cute house...adorable together!!! I think its a wonderful goal! Great card! Love the cut out house and clouds! Super cute card, Rose Ann! I LOVE the clouds, and the baker's twine at the bottom is the perfect touch! What a cutie card, Rose Ann! I think your resolution is a great one - we could all probably benefit from a little of this!! No resolutions here either! I prefer short-term goals throughout the year. Your card is adorable! So sunny and precious, RoseAnn! And what a worthy ongoing goal. I think I need this image and sentiment! Very cute and charming, I adore that house...waiting til the new release and then getting that house at the same time, can't wait!